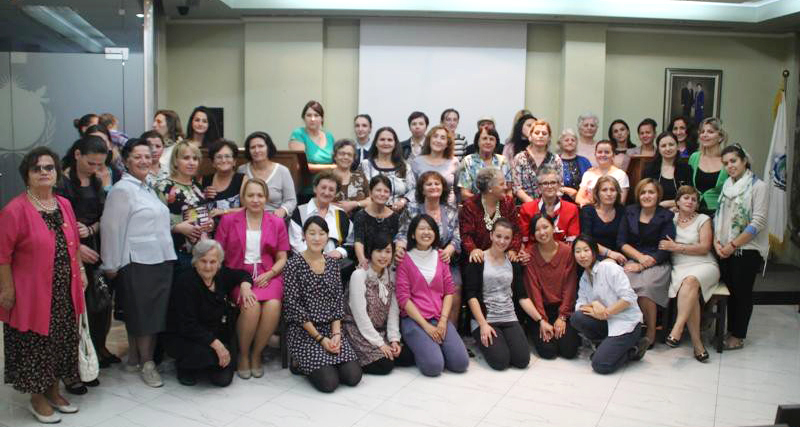 Women in Tirana: Where can we look for happiness? WFWP Albania: On Friday October 17th WFWP in Tirana organized a meeting with the title “Where can we look for happiness?” The goal of the meeting was to invite our regular members, as well as new guests, reconnect them to our movement after the period of summer and give them some words of inspiration based on the teachings of our Founders. Especially our desire was to bring in some younger guests and revive our audience, since many times it happened that our guests consisted of mainly pensioner ladies. One step towards this goal was inviting all the female FFWPU members, who united with this idea and responded by participating and inviting some members’ mothers and other guests. We also went out with leaflets to inform the local inhabitants about our activities and made some more intense outreach to invite new and old guests. We could see that our efforts gave results, as the hall got filled with over 40 people, among whom we could see some new as well as young faces. The meeting started shortly after 5 pm, coordinated by Marjeta Rroshi, who welcomed everyone and invited them to watch a short inspirational video as introduction. The content of the video pointed to how small acts of kindness can change somebody’s day and inspire kindness in return. This was somehow well related to our small project of gathering plastic bottle caps, which get recycled for wheelchairs. In fact, our participants brought roughly around 7 kg of taps this day, most of them collected by Mrs. Lirie Tahulla, chairwoman of Pensioners Association. Mrs. Tahulla in fact not only collects her own taps, but inspires many of her neighbors, friends and bar keepers to do the same, and collects the taps from them. Until now she is the real champion in collecting taps who does not mind asking people around or carrying bags with many kilograms of taps! 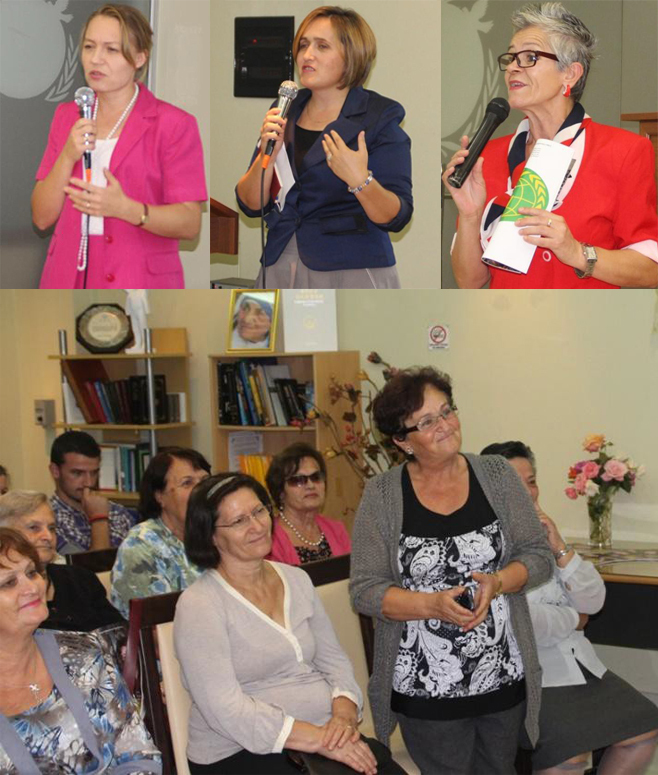 The main part of the program was the speech by Mrs. Katerina Minollari, which referred to the title of the meeting. The main message was that in order to be happy one needs to develop an attitude of gratitude, positivity, reacting out of our original nature and practicing love for others. The idea of practicing gratitude was illustrated by a video of a Chinese ballet couple – a man without a leg and a woman without a hand. The beauty of their dance seriously moved the audience and one new guest, Mrs. Fatime Kulla came up to spontaneously share her own thoughts and impressions after the speech. She related her own experience with a family of a handicapped mother, who despite her disability lived a life of dedication and happy service to her family. All these messages surely made everyone rethink our own strength of character and determination in joyfully overcoming various challenges of life. We then followed with announcements and the last part of our program, which was the encouragement to live life healthily and exercise. To do that our group of Japanese voluntaries gracefully presented “Bounce” dance with the music, sharing the experience of our Founder Mrs. Hak Ja Han Moon with a similar exercise. This exercise and dancing contributed to the already joyful atmosphere and the meeting concluded with lively chatting and refreshments. We really felt there was a very beautiful, heartistic atmosphere where people could feel comfortable and at ease and that they could gain some nourishment for their souls. This was surely made possible because of our unity and sincere investment of many members. It is important to mention that among the new guests were two journalists and a school teacher, who were interested in further cooperation, especially in submitting materials to our WFWP newsletter.